kanye west | Play Happy. Remember the featuring credit on Kanye West’s track “Paranoid” referring to a “Mr. Hudson”? 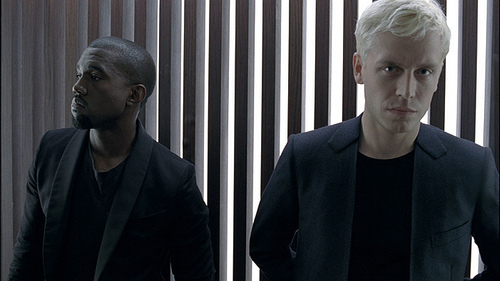 Well, the roles are reversed and Mr. Hudson has put out a new track featuring a Kanye solo (and yes, he’s auto-tuned). It’s a great, up-tempo track and definitely makes me want to get more into this guy and his band, Mr. Hudson and the Library. The above track comes from Mr. Hudson’s second album, “Straight No Chaser”, to be released on August 3. January 20, 2009: How long have you been waiting for this day!? Preliminary festivities begin, including music by The United States Marine Band, The San Francisco Boys Chorus, and the San Francisco Girls Chorus. Music composed by John Williams and performed by Itzhak Perlman, Yo-Yo Ma, Gabriela Montero, and Anthony McGill. President Barack Obama is sworn-in as the 44th President of the United States of America.